Most couples think of sweets for their wedding day celebration as a classic tiered wedding cake adorned with swirls of icing, flowers, and a traditional cake topper. There are many other delicious sweet treats that can be part of a wedding day menu, such as cupcakes, chocolate covered strawberries and even a chocolate fountain. Instead of a cake, many couples opt for fun wedding cupcakes to celebrate the sweetness of their marriage. Cupcakes can be decorated as tasty brides and grooms, adorned with flowers or hearts, or be as elaborate as any wedding cake. The groom's cake is a delicious wedding tradition many couples enjoy. 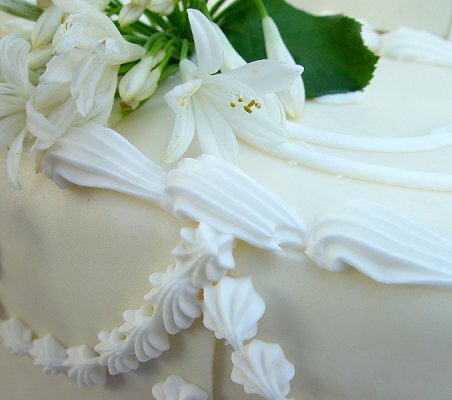 Whereas the wedding cake is typically lighter in both color and taste, with rich vanilla cakes the most popular flavor, the groom's cake is richly decadent. Chocolate is the most popular flavor for groom's cakes, and the decorations reflect his hobbies and passions such as sports, his career, or his Alma mater. Chocolate covered strawberries are an elegant and romantic choice for any wedding menu. The berries can be casually dipped in dark, milk, or white chocolate, or they can be elaborately decorated with candy tuxedos or white chocolate lace bridal gowns for a more elegant touch. A chocolate fountain is a fun and delicious way to add sweets to a wedding reception. The flowing chocolate is elegant and rich, and a variety of dipping items - fruits, pretzels, cake squares - can be provided for all guests to customize their treats. Many couples are adding wedding day sweets to their reception in the form of nostalgic candy bars. These bars typically include several candy jars filled with the couple's favorite treats, and guests can fill wedding favor boxes or bags with their own favorites to enjoy a sweet thank you from the couple. Customized fortune cookies are a fun and unique treat to include at a wedding. The cookies may have personalized romantic fortunes, a thank you from the bride and groom, or general prosperity messages in them, and they can be served as part of a buffet, placed at each place setting, or bundled into Chinese takeout wedding favor boxes for a themed treat. Candy coated almonds are traditional wedding day sweets. The sweetness of the candy coating represents the love a couple shares and the blessings of their friends and family members, while the bitterness of the almond represents the trials they will face and overcome in their life together. Candied almonds can be added to a dessert bar, placed in dishes on each table, or bundled into tulle bags or favor boxes for each guest. Couples interested in a diverse menu for their wedding day can include regional or ethic sweets as part of their dessert options. Pecan pie and red velvet cake are ideal for a southern wedding, for example, or couples may want to request a special relative's classic homemade treats to include. Romantic cookies are ideal wedding sweets that guests will enjoy. Hearts, rings, diamonds, wedding cakes, and wedding dresses are classic cookie shapes for weddings, or couples may want to opt for themed cookie shapes to match their event, such as seashells or sailboats for a beach wedding or snowflakes or holiday shapes for a winter wedding. Elegant gourmet truffles are popular wedding day sweets and come in a range of decadent flavors such as fruit purees, cappuccino, mocha, rum, hazelnut, and more. Truffles can be offered in small packages as wedding favors, or they may be arranged in trays for wedding dessert bar. Some couples even opt for truffles to decorate the tiers of a traditional wedding cake. Offering a delicious tray of sweet fruits is a great way to add variety to wedding desserts but still be conscientious of guests' menu preferences - not all guests will enjoy cakes, cookies, and other sweets. Grapes, melons, pineapple, and other fruits are a sweetly refreshing alternative. No matter what wedding day sweets a couple chooses, how those sweets are displayed is crucial. Elegant glasses and themed fruit bouquets can turn even simple puddings and mousses into festive wedding treats suitable for the most formal event.